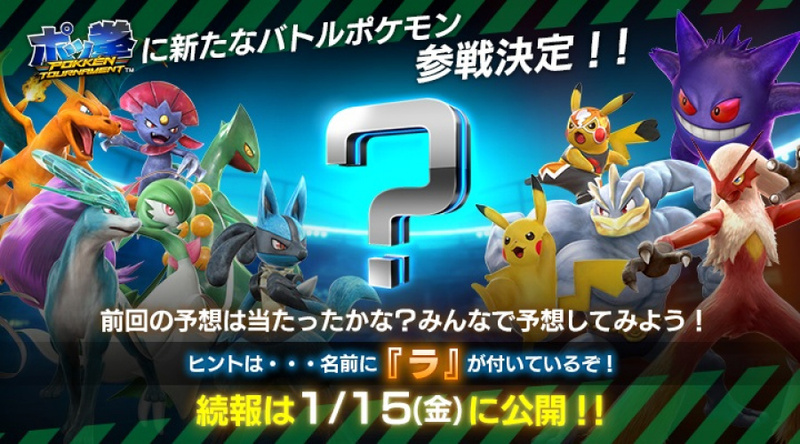 At the beginning of December, the Twitter account for Pokkén Tournament revealed that a new fighter character would be coming to Pokkén Tournament, along with a couple new support characters. About a week later, it was confirmed that Sceptile would be the new fighter, with Farfetch'd and Electrode being the support characters. It seems that we're seeing history repeat itself here, as another character has been teased for reveal next week, along with another new support character. The reveal will be made on the 15th, and to get people talking about it, it was hinted that the new fighter's Japanese name has the letter ラ (ra) in it. Make of that what you will, but all will be revealed soon. What do you think? What's your guess for who the new characters will be? Are you looking forward to this coming west? Share your thoughts in the comments below. Because of a certain hint, I'm really hoping we get Flygon. Especially since we didn't get Dragonite playable. @NoirUsernameHere I wouldn't mind Flygon. He doesn't get nearly enough love. 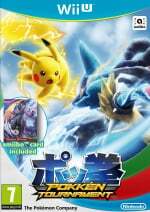 However, given that Blaziken and Sceptile are already included in the game, I'm guessing that it'll be Swampert. Maybe if I give up hoping for Heracross, it'll get announced. Haxorus! Because eating Pikachu with a face made of axes is too awesome not to include. @Shepdawg1 I hope not. If so then they might as well rename the game to Mario Bike Wii...oh wait, I mean Hokken Tournament. I got confused a second there, but I know what I'm complaining about now. Also it's Granbull, cuz why not. @arrjayjee: It's not Haxorus. Look on Bulbapedia for Pokemon with the ラ character in their name. Haxorus isn't one of them but you might find...the one...it could even be you...but only if your name contains a ラ.
I want either Heracross, Tyranitar, Aggron, Slowbro or Swampert to be playable in Pokkén, please. Gotta be Hitmonlee or Chan. I have no idea if either of those has Ra, but they need to show up at some point! Honestly in general so far I mostly find this thing's roster simultaneously confusing and underwhelming. It has a few left-field choices, but mostly in the, "Huh?" vein more than, "Wow, that's cool." Tyranitar is one of my favourites so it would be cool to see it in. I'm still a little unsure about getting this, but Tyranitar might push me to get it. I'd like Moltres to be in it, though I can't think of a good move set for it and I don't know if its name contains that character. Dusknoir could be a good fit for this game. Actually it wouldn't be that surprising if the next Pokémon will be Swampert, as Swampert's Japanese name is Ragera-ji or something like that . My guess is it's gonna be Flygon, Darkrai, Swampert, Tyranitar, Heracross, or Chandelure. Chandelure's wishful thinking though. I would love if Dragonite made it in. Swampert's okay too though. @TeeJay Dragonite is in as an assist. @IceClimbers What? For real? I mean it's better than nothing, but...I'm surprised that this is the first time I'm hearing this. Apparently 50 staff members tried to guess the character. Only one of them got it right. 31 of them got it wrong and were salty about it. Hawlucha makes too much sense. I don't know why they haven't made it in yet. How many Pokémon have been announced for the roster in total? I would hope that there would be a healthy amount of playable characters in this. @Joenen it doesn't have to start with "ra", just have it anywhere in the name. @MitchVogel Actually, both of them have ra in them. Hirmonchan is Ebiwaraa, and Hitmonlee is Sawamuraa, if I remember correctly. Swampert would make sense as the other Hoenn starters are in the game already. Also, Raikou could work as an alternative to Suicune. As @Krisi said, Hitmonchan and Hitmonlee both have the 'ra' in their Japanese names, and as they are natural fighters it only seems fitting for them to be in. Weavile, Gardevoir and Suicune are welcome and unlikely additions to be the cast, but the rest elicit nothing but a yawn. I hope Gengar can at least fight as his Mega form. Pretty sure it's Mario, guys. It's probably Swampert who is called Laglarge in Japan, spelled Raguraaji (ラグラージ) in katakana. That combined with the fact that Blaziken and Sceptile is already in the game, I would be surprised if it isn't Swampert. "it was hinted that the new fighter's Japanese name has the letter ラ (ra) in it." Yeah, uh... "ra" isn't a letter. Get Tyranitar in and the chances of me buying this game will increase significantly. @GeminiSaint It's a letter in Japanese, which contains a whole syllable. It's not that hard. Oh my goodness... Lampent's name has TWO of that character! I'm not planning on buying the game as of right now, but I definitely would just to play as Lampent. None of the playable Pokemon so far interest me, but I love Lampent. If it's not Lampent, I hope it's Vileplume or Reuniclus. What I mean is that they're not called "letters". They're Japanese characters. I predict Namco, being so damn proud of their heritage, (as they should be) will invent an all-new Pokemon based on a character in the Tekken franchise! Sticking with the "Ra" restriction, that could mean either Bryan Fury, Hwoarang, Lee Chaolan, or (and they'd probably go with this one) Lars Alexandersson. Either way it'll be awesome in that you'll be able to go to Toys R Us and grab it for your copy of XY, or ORAS. @GeminiSaint we call them Kana, to be more specific. I know what you meant. As a Japanese speaker I dont mind people saying the word letter too much. Its a step above saying its part of the "Japanese alphabet". Swampert or riot, my OCD will go insane if we're missing a single starter from a region when the other two are already in. I'm somehow sure it will be a Dragon-type since there seems to be a lack of Dragon-types in Pokkén at the moment. Come on Gallade, you can do this! I'm going to vote "a fire emblem character"
From the list of Pokemon it could be, I'm hoping for either Hydreigon or Tyranitar. But I really hope the developers don't chicken out and put in more Gen 1 Pokemon. Not saying there shouldn't be more Gen 1 Pokemon ever, but I'd like them to even out the numbers with Pokemon from other Gens first. While it's almost assuredly Swampert, I think it would be hilarious if it was Vanilluxe. That would make quite a few people salty. Swampert. They should definitely add in one character a month for the rest of the year. Do a lot of people really like Swampart (I've rarely ever seen Swampert as a contender for most people's favorite Pokemon), or just think Swampert is likely. If Swampert is playable all 3 Generation 3 starters will be playable before any other Gen.
@Shepdawg1 Swampert is the most likely candidate, of course. I'd love me a surprise, though. I kinda started to lose a little interest in Pokken after hearing about the controller situation with local multiplayer (let's be real, the Gamepad is not a competitive friendly controller, and I'm not saying I won't buy it, but I won't be in a hurry to buy the game either), but an interesting character would definitely reel me in. @sillygostly To be fair Pikachu was, is, and most likely will always be the most popular Pokemon in the series and it's kind of a shoe in for anything remotely related to the series (though I do think having Pikachu twice is a bit annoying, even if Libre has a different moveset than her normal counterpart). And the only real oddball choice is Weavile since all the other Pokemon are extremely popular like Suicune and Charizard, or like Machamp just fit the fighting game material pretty well. Heck I'd argue that the roster save Machamp and Weavile are all in the top 50-100 most popular Pokemon. Though on a personal note, while I'm not a big fan of their Pokemon, I hope that we get at least 1 rep from each of gen 5 and 6 so that each gen gets a rep, even if my favorite gens (1 and 3) are getting the lion's share of the roster. As someone who stopped playing at Gold (not sure what 'gen' that is...), the inclusion of both ('monlee if I had to choose 1; screw 'montop, that phony!!) is kind of a deal breaker. The fact that the staff mostly guessed incorrectly tells me I'm probably going to have to wait for the next announcement (at least) for the most appropriate and manifest Pokemon additions to the game. Pikachu is probably the most popular Pokemon with the general public, since Pikachu is the Pokemon series mascot, but it's quite rare to find an actual Pokemon fan who's favorite Pokemon is Pikachu. And by "Pokemon fan" I don't mean people who only played the Gen 1 games and watched some of the Gen 1 anime. @sillygostly Of course Gengar mega evolves, it was in his trailer. Yeah the roster is kinda underwhelming right now. I really want Pangoro, but I think they're gonna reveal Swampert (what I'm also cool with). @IceClimbers : I voted for Magikarp to be in Smash. The poor sucker doesn't get enough love. I would love for there to be at LEAST one "troll" Pokémon. Gliscor is the one I think can be. Swampert too have good chances. I would love Chandelure to get into the roster purely because it's my favourite Pokemon and I know it will never happen.